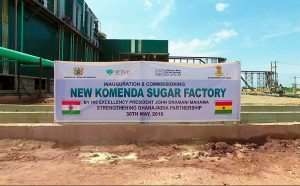 The Minority in Parliament has accused the ruling government of deliberately causing the Komenda Sugar Factory to be undervalued so it can be sold off cheaply to cronies. According to the Deputy Minority Spokesperson for Trade, Industry and Tourism, Yusif Sulemana, government has side-stepped recommendations of a technical audit of the project only to pursue a motive of selling off the company. The factory was shut down months after it was commissioned in 2016 and has been seemingly abandoned for the past 2 years. Trade and Industry Minister, Alan Kyerematen on Thursday told Parliament, a new strategic investor will be announced by the end of April to take over the company. In an interview with Citi News, the Bole Bamboi MP, questioned government's motives in its quest to sell off the company. According to the Trade and Industry Minister, the government has conducted a technical audit into what caused the shutdown of the factory in a bid to create the right conditions for it to be revived. Answering questions in Parliament on Thursday, Alan Kyerematen said the quest to bring the factory back to life is on course. President Nana Akufo-Addo recently said the government is currently scouting for a strategic investor to inject life into the struggling Komenda Sugar factory. While lamenting the lack of proper planning in the implementation of the project by the Mahama administration, President Akufo-Addo gave assurances of ensuring that the factory becomes viable. The $35 million factory remains dormant, due to a lack of funds. It was closed down in June 2016, barely a month after then-President John Mahama commissioned it. It was expected to be producing about 1,250 tonnes of sugar each day. The factory, at its full capacity, can, in a year, produce 97% of the nation's sugar needs, representing 250,000 tons. Sugarcane farmers who had hopes of cultivating of supplying the Komenda Sugar factory have also been compelled to sell to producers of akpeteshie.